Married or cohabitating men desire need deserve a “man cave”. A sanctuary where he can escape too, a place he can call his own. A place where he and his friends can go to be men, talk about what they want, drink beer, smoke cigars, watch the game, play cards, fart, scratch themselves or whatever they want without the worry of offending anyone or being labeled a “pig”. An extra room in the house, the basement or maybe like mine, in the garage. Men never really outgrow wanting a clubhouse. At the present time, my man cave looks NOTHING like the man cave pictured here but I’m working on it. My man cave has been shall we say “out of commission” since we moved into this house a little over four years ago. The last house we lived in was a smaller house with a two car garage. The house we live in now is a larger house with only a one car garage. We gave up some garage space for more house space. Now our two car garage at the old house was pretty full so when we moved into this house with this one car garage, it took NO TIME to fill it. As a matter of fact, it was no problem to overfill it. As we moved in to this house, boxes of “stuff” went into the garage to stay out of the way of moving in the larger “stuff” like furniture. Many of those boxes stayed out in the garage for a very long time. After moving in, we of course accumulated more and more things that somehow always ended up into the already overflowing garage. If someone had something they didn’t know what to do with anymore but didn’t want to get rid of, out to the garage it went. It took no time at all to fill the garage so full of “stuff” that you couldn’t even see the floor of the garage. (For the remainder of this post, “stuff” will be referred to as “crap” because that’s what it really is). Every spring Paula and I would get a wild hair up our asses and go out to the garage with the intent of cleaning it. We would spend a few hours out there and maybe get some kind of a path through the crap but that’s about as far as we would get. The amount of crap in there was quite overwhelming! From one spring to the next, the path was filled with more crap that accumulated in there and another path was made the next spring. We were really getting nowhere in the cleaning up of the garage. Enough was ENOUGH for me last month and I decided it was time to get the garage cleaned up and regain my man cave! My son’s car needed work done, my car needed work done, Paula’s car needed work done and the crap HAD to go! I will soon have a golf cart but nowhere to store it if the garage didn’t get cleaned out. SO, with the help of my son’s when possible, we went to work. If it was not NEEDED, it went into a crap pile in the back yard for a special pickup by the trash man. It took my son’s and me about a week to get the garage in good enough shape to pull a car into it and install some lighting. Some nights we worked out there until midnight trying to get the garage into a useable garage. FINALLY, after hours and hours of work, the garage transformed into my man cave. After the man cave was established, it was time to get working on the cars which explains my absence lately. Right now, my man cave is pretty rough at best but I have many many plans for my little cave. Overhead storage, my air compressor up overhead, storage cabinets, insulation, insulated garage door, a new man door, new windows, new fuse box, lighting, power outlets, drywall, ventless furnace, air conditioning and much much much more. I already have a refrigerator and stereo out there as that is a MUST when working on cars or pretty much ANYTHING. I think it’s going to be A LOT of fun transforming the garage into a killer man cave!! it was nice knowing you tony…cuz pull a stunt like that and we’ll read your obit on the internet. let’s see pics of YOUR cave gary! Gosh! I hope you can make your man-cave look like the one in the photo! That would be awesome. Husband had a workshop built about a year after moving here. It is a stand alone 2 1/2 car garage (pole barn) with a raised ceiling. He painted the walls bright white so they would reflect light. He works on his Italian car there as well as doing wood projects. It’s brilliant and I’m so glad he has this space to “play” in. He deserves it, as I’m sure you do. Everybody needs some space to themselves. I really need my own man cave. I have no privacy, and this house is way too small. 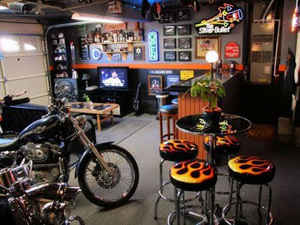 I envy all the fellas with man caves. I’m not bias about the whole man cave here. I think women need a “woman cave” just as much as a man needs a man cave. Tony, if you do bring it in, you’d better blame it on Flat Tony. uh tony…take it from a woman…NO! Dont’ do it! Not unless you have a death wish! not when the men in the house don’t have a cave of their own. I don’t want to girlify it..I’d be happy if people helped me keep it clean. The man cave post! I have been waiting for this. That is a sweet man cave pictured there. Good luck with yours. Can’t wait to see your pics. Dude, man caves rock! That’s where we women send you all when we want a little peace and quiet ourselves. Everyone wins!!!! My hubs has no desire for a man cave.. he’d rather be out fishing or hunting or something along those lines.. Otherwise his bum is in the bed sleeping or watching tv.. No prob.. I dont watch tv.. works for me. We need to clean out my closet bad like. Its alot like your garage sounded.. Its full to the brim w/ boxes and fishing crap..
Love the Idea, every man deserves one, Good for your Gary for reminding all women to give their man his own space. Good luck on the garage remodel. It’s one of the favorite rooms in my house where I can sneak away for some quite time.